Rebel Troopers are the heart of the Rebellion, they are the front line skirmishers fighting to break the unjust tyranny of the Empire around the galaxy. In Star Wars: Legion Rebel Troopers are the Rebels first corps unit option. They are well rounded, adaptable, and efficient - and as such see use in the majority of Rebel forces. Rebel Troopers are the workhorse of your list. Their primary job is to complete or secure the mission objectives, doing their best to remain in cover as they do so. Their secondary job is to engage a variety of enemies under a variety of circumstances. The base unit of Rebel Troopers are more or less completely average in all ways except defense. However, when you add into account their Nimble keyword and a Dodge token they become perfectly average (increasing the damage they cancel from 1.3 to 2 against the average of 4 hits). This defines how to play them more than how good they are. At 40 points a base unit of Rebel Troopers is on par for efficiency. Z-6: This gun is a variance monster. its white dice can easily put out 0 damage or as much as 6, but on average it will put out 1.5 damage. It also raises critical chances from 0.5 to 1.25 . because of the variance it is an unreliable weapon to split fire with and is best used to add dice against the primary target. It does not change the range at which Rebel Troopers can shoot at, add any keywords, or change the way that they want to play. Its primary value is in its upper end potential and hoping you get lucky, "Rebellions are built on hope" after all. This weapon is recommended. you may wonder why the first time you roll zero hits, but you'll get it the next time you roll 5 hits. MPL-57: This is a well rounded weapon, but its keywords make it primarily anti-vehicle. Like the Z-6 its 2 red dice increase the units expected damage output by 1.5 However because they are red dice it is a unlikely to roll 0 hits but its upper potential is limited to 2. The MPL-57's keywords (Impact 1 and Ion 1) mean that while it is effective against all targets, it is super effective against vehicles. Impact 1 raises the units expected damage against a vehicle from 0.5 to 1.25 (the same increase with the Z-6) which is not impressive on its own, but the Ion keyword adds a control element to the unit. Ion tokens remove actions from a vehicle which can keep it from getting tokens that it was counting on, keeping it from moving to a better position, or even keeping it from attacking. Two Ion tokens on an AT-ST keep it from performing any actions the next turn, effectively neutralizing a huge percentage of the enemies force. This weapon does exhaust when fired though so you will want to pick your targets carefully. The MPL-57 is recommended, the value of the weapon depends on the amount of vehicles in the meta and I wouldn't recommend taking more than one or two. The base unit of Rebel Troopers are efficient, and you wouldn't be making a mistake to leave them un-upgraded. If you do add upgrades to the unit keep in mind that adding figures increases how likely they are to be targeted and lowers their expected damage resistance. A Rebel Trooper unit with an extra trooper and Z-6 has the damage output of an average 80 point unit but their damage resistance drops from 50% with a dodge token to 44.5% with a dodge token making them slightly inefficient. Grenades do not change Rebel Troopers as much as they change Stormtroopers, they do not increase expected damage output but the added keywords can be situationally useful. The Environmental Gear upgrade is also very useful on Rebel Troopers, because they want to be spending all of their time in and around cover and still being able to move at full speed is very useful. With the addition of wave 3 expansions the Rebel Troopers now have access to several new and useful upgrade options. Fragmentation Grenades: These are incredibly strong on your corps troops, just a 4 man unit with grenades increases their damage output from 2 to 3.5 making them almost as effective as an 80 point unit for just 45 points, if you increase to the 5th trooper and Z6 you are now outputting 6.625 damage at range 1 for a 77 points! this is a strongly recommended upgrade on Rebel Troopers. Recon Intel: for just 2 points this gives your unit scout 2, which is a pretty good benefit. If you have the points to spare you should consider it, but its not essential. Rebel Troopers suffer from below average survivability and will want to keep this in mind when deciding how to play them. They will want to take advantage of cover or a Dodge Token whenever possible to mitigate this weakness. When deploying Rebel Troopers you will want to position them near cover and have a plan on how to move them from cover to cover towards the mission objective (Environmental Gear will help with this when moving through difficult terrain or over barricades). Since Rebel Troopers are so reliant on a Dodge Token, you will want to be activating them first before the enemy has a chance to attack them; and because Rebel Trooper units are relatively inexpensive, numerous, and want to be activated first this can create an overarching strategy for the Rebel player of out activating the enemy player - in this strategy the Rebel player takes many lower cost units and front loads their turn with less impactful activations saving their more powerful units' activations until after the enemy unit has activated and cant retaliate. 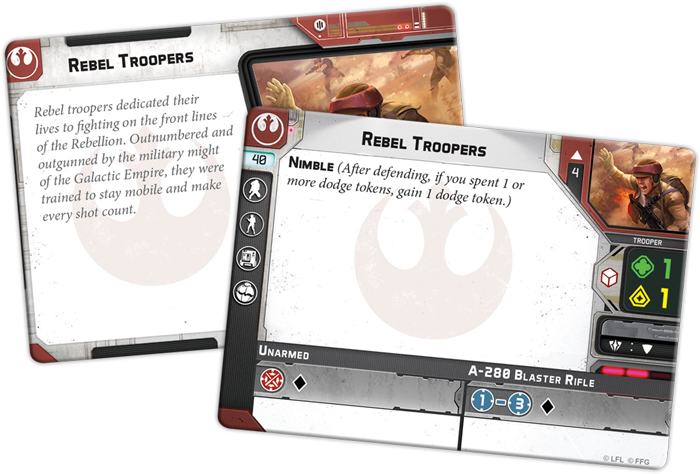 The Rebel Trooper units ideally want to get a dodge token from outside themselves (either a command card or Take Cover) and then move into cover and shoot whenever possible. When they are unable to reach cover on a move they want to either double move from cover to cover or move and dodge if the double move wouldn't get them back into cover. If they are in a position they want to stay at they can dodge and shoot, or aim and shoot if they got a dodge token from outside themselves. If they are able to end their move in cover it is acceptable to use their other action on an attack instead of a dodge. Weapon and upgrade selection doesn't affect how you will want to play aRebel Trooper unit much, it only changes their preferred target selection. A unit with Z-6 attacking a vehicle and a unit with an MPL-57 attacking troopers is just fine. Keep in mind that their Courage value is 1, so they will want to be relatively near a commander as they move up the table or in a position that is out of range or LoS of enemy targets so that they do not panic and run. When playing against Rebel Troopers it is important to keep in mind that they are reliant on their cover and dodge token to mitigate their poor survivability. The best way to counter them is to activate before them and attack them while they dont have a dodge token. Even if you do not place a wound on them the supression should keep them from being able to get their dodge action during their activation. Whenever possible you should have a plan on denying them cover, whether from flanking their cover, using a weapon that has blast, or a unit that has sharpshooter. It can be a good idea to finish off a unit of Rebel Troopers with few men remaining instead of attacking a more valuable target, as even one trooper still adds an activation token to the opponents list which they can use to stall their more valuable unit activations.